Google is now a part of our life. From search to emails and smartphones, Google is everywhere with us. Daily we use various Google services including Gmail, Calendar, Google Search, Picasa, Android, Drive, Google+, YouTube, Google fit and more. We use these services and upload our data and content depending on what service we are using. But Google knows that we are the owner of the data we uploaded on its services. This is the reason it has already given us a way to download data. If you want to download or export data stored on these Google services to your PC, you can download it with a Google service called Google Takeout. Google Takeout is a Google’s service that allows users of Google products to export their data in ZIP format. Users can select different Google services. Google keeps on updating list of services depending on the services it currently offers. Users can select one of many services to allow data downloading. This service was created by the Google Data Liberation Front on June 28, 2011. 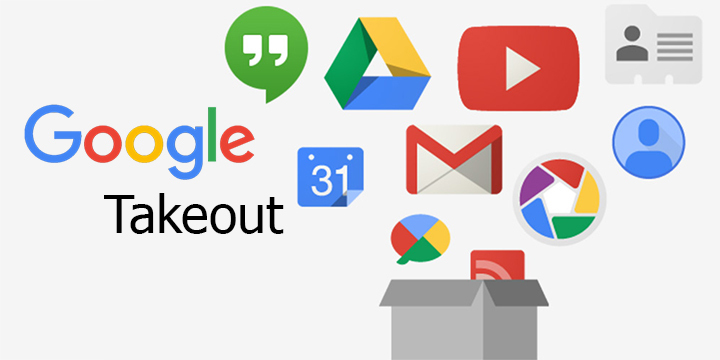 As a Google or its product user, you must know about Google Takeout. Follow these steps to download data from Google accounts. Step 1: Go to Google Takeout and login with your Google account passwords. Step 2: Now select the services you want to include data from. By default, all services will be selected. You can uncheck which you do not want to be included in the archive. To uncheck, click on the select box in front of the service. Step 3: Once you are done with selecting the services, scroll down to find the next button. It will be at the end of the list of services. Step 4: After clicking on next, it will ask you to select the File type and delivery method. You can select from Zip, tbz or Tgz formats. In delivery methods, you can either select it to send download link in email or add the archive in your Google Drive, Dropbox or OneDrive cloud storage account. Step 4: Once you start, it will show the progress bar and starts creating Archive or your data. After the progress complete, you can download the archive from the download button. This archive will also be available in the Google Takeout to download data anytime. You will also receive download link in your email. If you selected to add in cloud storage service, it will be uploaded there. You can access your cloud storage account to see the data uploaded by this service. If you opted to receive link in your email, it is your responsibility to download your data before the expiry date. Google clearly mentions the expiry date in the email. The expiry date is to protect your data for unauthorized access. If someone gets access to your emails, he will not be able to use the download links. This is the reason to add the expiry option. This was the basic introduction of Google Takeout and how to use this service to download data form different Google services. This service is very useful if you are thinking to stop using a Google service. You should not leave your data but download it for future reference purpose. I recommend you to download data before deleting any Google account. It supports almost all Google services. So, you have full control on your data. Try Google Takeout to download your data. If you have anything to ask, you can comment below. You can also like our Facebook page to have discussion and get latest updates. Do not forget to share this article with your friends to let them know about Google takeout and its use.